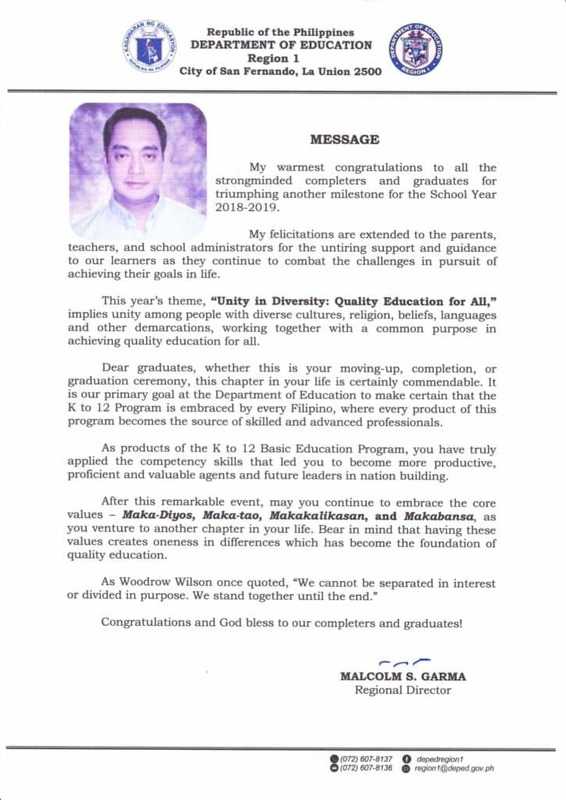 Official Graduation Message of DepEd Region I Regional Director Malcolm S. Garma for the completers and graduates for School Year 2018-2019. My warmest congratulations to all the strong minded completers and graduates for triumphing another milestone for the School Year 2018-2019. My felicitations are extended to the parents, teachers, and school administrators for the untiring support and guidance to our learners as they continue to combat the challenges in pursuit of achieving their goals in life. This year’s theme, “Unity in Diversity: Quality Education for All,” implies unity among people with diverse cultures, religion, beliefs, languages and other demarcations, working together with a common purpose in achieving quality education for all. Dear graduates, whether this is your moving-up, completion, or graduation ceremony, this chapter in your life is certainly commendable. It is our primary goal at the Department of Education to make certain that the K to 12 Program is embraced by every Filipino, where every product of this program becomes the source of skilled and advanced professionals. As products of the K to 12 Basic Education Program, you have truly applied the competency skills that led you to become more productive, proficient and valuable agents and future leaders in nation building. After this remarkable event, may you continue to embrace the core values – Maka-Diyos, Maka-tao, Makakalikasan, and Makabansa, as you venture to another chapter in your life. Bear in mind that having these values creates oneness in differences which has become the foundation of quality education. Congratulations and God bless to our completers and graduates!